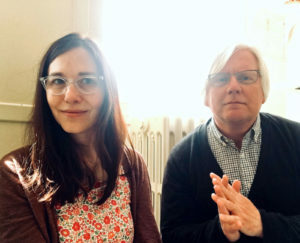 “All I cannot say I hope you know, all you cannot say I hope I can hear,” sings Karen Peris on “Look Out from Your Window,” the strong, circular, and somewhat quirky third track from the innocence mission’s latest album, Sun on the Square. These lines, possibly spoken to her children — one of whom actually plays viola on the song– could be called emblematic for the album. The album is being released June 29 by Badman Recording Co. In their own way, Karen and her husband and fellow guitarist, Don Peris, have spent years trying to voice the inexpressible. Since forming the innocence mission in 1985 with Mike Bitts, upright bassist and friend from their Catholic high school, the dreamy, orchestral folk band have spent ten full-lengths speaking to our collective memory and awe at life’s mysteries. Their songs are full of sensory imagery and deeply felt instrumentation, and it’s their unique way of trying to approach universal joys and sorrows that allows the band to achieve the emotional connection with their listeners that makes them so special. With Sun on the Square, the sea creatures have grown more magnificent than ever. Without losing an iota of the intimacy from their past releases like Birds of My Neighborhood and We Walked in Song, the innocence mission has made what is possibly their most dynamic album to date. Expansive, lush arrangements on songs like “Look Out from Your Window,” “Green Bus” and “Buildings in Flower” add intensity to lines like, “All the leafiness of a thousand miles/Is felt in the heart, a change that has started.” Don shares, “I love Karen’s beautiful, fingerpicked guitar parts and recording to them, adding a high, reverb-y electric sometimes, or another line of nylon string that would be a companion to hers.” Don’s stunning guitar work on Light of Winter” provides an initial landscape for Karen’s voice that is deepened in color by Mike’s upright bass and Karen’s thrummed piano and lines of clarinet- like melodica. Another highlight track centered on change, absence, and starting over, “Shadow of the Pines,” begins with little more than Karen’s muted piano and poignant singing, progressing in increments as bursts of accordion, viola, guitars, and field organ repeat the keys’ refrain, while Don’s drumming gives a huge, romantic swing to the affair. By the end, you could envision it playing behind a scene in a Jean-Pierre Jeunet film. Finding ways to communicate the incommunicable is the ethos under which the innocence mission have invariably written music. The Peris’ ability to parse life’s large and small moments and spaces in poetic song is why the band has remained vital all these years. With Sun on the Square, their first release on Badman Recording Co. in eight years, they have adopted a wider, more cinematic compositional scope, one where musical interludes redouble the emotions of song melody and lyrics. Here, the innocence mission’s exploration of the meaningful in our human experience resonates with profound beauty like never before.